Hardwood, although no longer a tree, still acts like one in many ways. They still react to water and moisture the same way a tree in the ground would. Trees swell due to the amounts of water in them. Hardwood floors are still trees in a sense, just made into a finer product. They will react accordingly to the amount of moisture in the air or the amount of water dropped on them. When hardwood floors have too much water, they will expand. When the moisture in the air is lower, they will shrink. Hardwood floors are greatly affected by the moisture in the air. If you live in an area that has more humid weather in the warmer months, then your floor will swell from the added moisture in the air, making it look like your floors are damaged. This works similarly to what happens to a person when they get too hot. Have you ever noticed your fingers swell when you sweat a lot or if it’s really warm where you are? Hardwood floors do something similar when there is too much moisture in the air. An easy remedy for this is to keep the humidity and moisture in your home regulated. After you have checked out your space and made sure the climate is perfect for your newly chosen hardwood floors, then you need to acclimate the flooring to your space. The wood should be spread out and sit on the subfloor in the space for roughly 4 days. This will give the wood time to expand if it has to or shrink. After four days, the wood will know how it should act in your environment and be ready to install. – Sweep your hardwood floors regularly. This will help keep your floor clean and will help keep moisture off your floors. – Vacuum your floors as often as you would carpet. The vacuum will pick up any debris or water you may have missed when sweeping. – Use a lightly dampened cloth to clean your hardwood floors. Remember, hardwood reacts to water in bad ways. So to avoid buckling or cupping floors, use light cleaners and avoid using excessive amounts of water on your floors. – Consider purchasing a floor care kit that the manufacturer or retailer suggested. You can’t always count on home remedies to keep your floors clean and in perfect shape. In this case, the person you bought the floor from knows best. – Different finishes call for different cleaners. 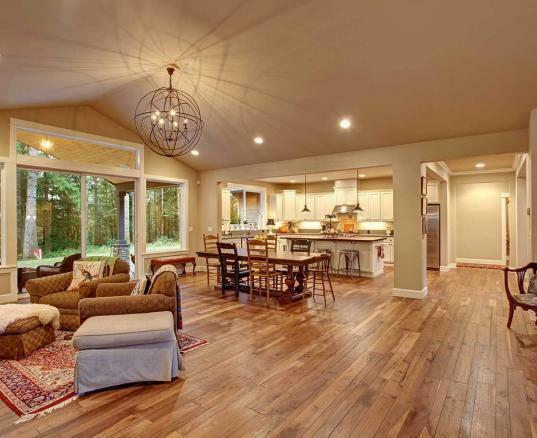 Know what kind of cleaner your hardwood floors need by asking or looking it up. For more care information, check out this hardwood floor PDF. We have a great selection of hardwood floors for a better price than any other retailer. Our prefinished hardwood floors are the perfect fit for anyone looking for a floor that won’t take too much work to install. Consider buying our engineered hardwood floors too if you want to go that route. Reach out to us with any questions and to start planning your remodel. We look forward to working with you on your next remodel!